Posted in Multilingual education and English Medium Instruction (EMI) on October 29, 2014 by British Council India. English Partnerships team of the British Council India convened a research round-table on multilingual education in Delhi on 18 and 19 September 2014. The Centre for Literacy and Multilingualism at the University of Reading had proposed a collaborative research partnership with Indian universities and institutions to investigate the issues around multilingual literacy and education at the primary level in India. India is a country with linguistic diversity that befits a continent. There is in place a three language formula for school education. However, in practice teachers are often faced with immense difficulty dealing with the challenges this diversity poses in everyday classroom situations. How do teachers deal with a multilingual class that does not match with his or her own language(s)? How does one transition students who speak a tribal or a highly localised language to the provincial language and then on to Hindi, the national language? And where does English sit within all of this, when is it right to introduce this and how? Before the roundtable, Prof Ianthi Maria Tsimpli and Prof Jeanine Treffers-Daller, both from the Centre for Literacy and Multilingualism at the University of Reading and I spent some time looking at classroom practices at a few schools in North India. At a rural primary school run by the NGO Digantar well outside Jaipur, the last few miles of the access road to which was no more than a ribbon of dirt track, we witnessed outstanding practice of how Dhundari, the home language of the pupils, was being innovatively used by the teachers to teach them the basics, introducing them gradually to Hindi and all along using a number of creative tactile experiments to introduce complex concepts such as “place value” in mathematics or “condensation” in environment science. Colleagues from an education NGO, Sandhan, led by the inspirational Dr Sharda Jain, met us and discussed how they dealt with cultural issues around language teaching in Kasturba Gandhi Balika Vidyalay, a girls’ school in Udaipur (Rajasthan). “While introducing English, which is perceived to be important for the world of work, we have to be really careful not to devalue the home language,” Dr Jain observed. The visit to Digantar school in Jaipur was an unprecedented experience for us. The commitment of the teachers, the collegiality, the joyful atmosphere between them and the pupils and the hard work that both sides are putting into this is exemplary. Re. resources: we were impressed by the computer room where pupils could engage in developing computer skills and used both Hindi and English for word processing. Needless to say, the human resources in the Digantar school outweigh all other challenges. We also visited a Central School (Kendriya Vidyalay) and a state-government school, both in Delhi, observing the care, concern and enthusiasm of the teachers in adopting innovative methodologies in dealing with the linguistic, cultural and socio-economic diversity in India’s capital and largest city. The research round-table was the first step towards an open discussion, charting out the key questions and the hypothesis for the research, identifying possible approaches, inviting contributors to join advisory and programme boards and charting out a roadmap and a provisional timetable. At the meeting in Delhi, Ianthi and Jeanine met with representatives of the British Council India, Unicef India, academics from Universities in India and representatives from NGOs and CSROs to discuss the framework for setting up a longitudinal project into the role of mothertongues and regional languages in learning and teaching in India. 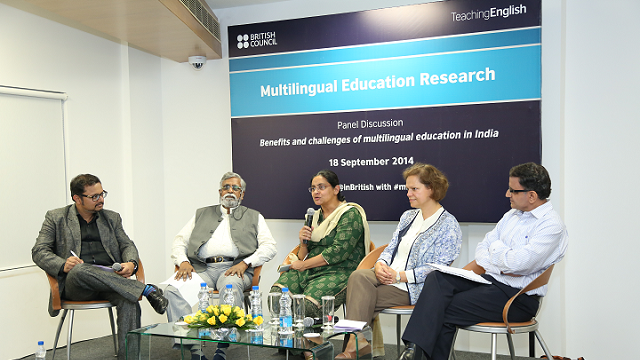 On the evening of 18 September, there was a panel discussion on the “Benefits and challenges of multilingual education in India” where Dr Dhir Jhingran (Unicef India), Prof Ianthi Tsimpli, Dr Rukmini Banerji (Pratham – ASER Centre), Prof Paul Gunashekar (EFL University, Hyderabad) spoke on the various aspects of multilingual education in India, with critical contributions from Prof Ajit Mohanty and Dr Mahendra Mishra (ICICI Foundation). We are now putting together a research consortium of interested parties who would like to be involved in the development of this project, with a view to submit a joint application for funding. First of all I would like to Congratulate your team for such kind of initiative to investigate issues around multilingual education in India.Our social dilects affect on language proficiency. I request you to send related link for our study so that it will be helpful for us..